This is called Grid Parity and is the point in which electricity costs from renewable sources such as wind and solar is the same cost as purchasing from the utility company. It has long been thought of as the “Holy Grail” of alternative energy and the possible savior towards climate change. Imagine having the choice to choose a lesser cost form of energy that is 100% renewable. This is what economists are touting as flicking the switch! This reality has cause over 11.2 gigawatts of new PV to be added to the US grid in 2016 making solar the top fuel source for the first time in US grid tracking history. This amounts to a whopping 125 panels being added to the grid every minute in the USA which doubled that of 2015. With this kind of investment it is certain that solar will fall to ½ the cost of its competing fossil fuel alternatives in the next decade. 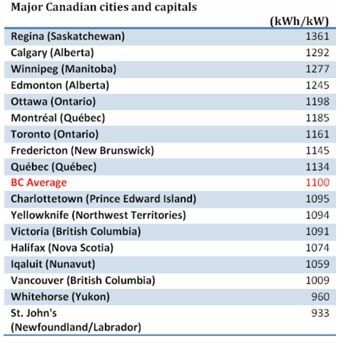 It can also be said that solar in Canada has also reached parity in most provinces even before credits and rebates. Canada has some of the best opportunities in solar and it is expected in 2017 that the vast growth south of the boarder will be seen also in Canada. The investment opportunity has never been better and the proof can be seen nationwide in all provinces as solar panels begin to pop up on roof tops at record rates. In Canada solar has reached its all-time low at install costs averaging $3/watt. This means that an average 10 KW residential system can be installed for roughly $30,000. With a 30 year life expectancy and the average cost per Kw is already lower in almost all provinces. Here is a simplified example. Below is a chart that represents the nationwide average solar production per major city. So for example let’s take Calgary with total Production over system life = 30 years x 1292 kWh/kW of solar installed = 38,310 kWh. Each kilowatt of solar installed (on an unshaded low slope roof facing SE to SW) will produce between 1000 and 1350 kWh per year depending on the local solar climate. Solar systems in the 5-10kW size can be installed by qualified solar contractors for approximately $3/watt. Assume the average is $3000 per kW. Solar equipment can produce electricity reliably for 30 years or more. Assume a 30 year life. Assume your project is paid for in cash (presently earning almost nothing in an interest-bearing bank account). The cost of capital has been excluded in this simplified model. Total Production over system life = 30 years x 1277 kWh/kW of solar installed = 38,760 kWh. Manitoba - Cost per kWh = $3000 per kW (installed cost)/ 38,750kWh = $0.0774/kWh. This is almost a full cent below Manitoba Hydro’s current cost of $0.084/Kw. Now this is done on a basis without any grants or tax credits. In Manitoba there is the Manitoba Hydro Solar Rebate Program of a $1/Watt incentive which leaves Manitoba in the forefront as far as solar installation costs. So this brings down the simple cost to $052/Kw. So what does this mean for solar in Canada? Now is the time! Solar has hit an all-time low and the drop in equipment cost that we have seen in the past years have leveled off. We do not expect to see much of a further drop in complete installation cost as the $3/watt mark has been the average now for a few years. The reason is, that any drop in manufacturing costs is balanced by an ever- increasing physical installation cost brought about by tighter regulations by utilities and municipalities leading to higher installation costs.